A theme that runs through science fiction and fantasy literature is the idea of machines taking on human personalities. In a reverse manner, some human beings who gain the top leadership role in their organization become machine-like as if they have lost their human personality. 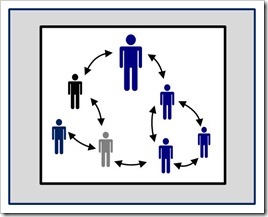 Why does this happen, and what should leaders do to avoid becoming a human thinking machine? A principal issue is our self-management as leaders. With increased responsibility, comes a higher level of complexity to the decisions we make. The range and substance of the information to master in short periods of time increases. The critical nature of the decisions to be made are greater. The pressure to perform grows. With greater responsibility comes greater opportunity for both failure and success. The natural reaction to this scenario is to reduce the range of options we must manage. We close off various possible directions. We enter negotiations with a singular preconceived notion of the outcome. We hunker-down, get focused, and work toward the goals that we’ve established. Unfortunately, to do so also limits our options, and closes off resources that may provided the answer to the challenges we face. Leadership is a counter-intuitive human phenomenon. Even the most able of us are not born to leadership. To lead is not to close off ourselves from the outside world, and reduce our field of vision to something that is manageable. In fact, it is the opposite, we must practice an openness that may seem to some people as reckless, irresponsible behavior. The kind of leadership described here makes assumptions about why we are in the position of leader. We assume that we are here because we are able, knowledgeable and prepared. These are risky assumptions because none of us knows all that we need to know, nor, have experienced everything necessary to be completely prepared, or have developed the full range of skills that we need, and lastly, to have become an emotionally mature personal who is prepared to handle the personal demands of leading an organization. What I don’t know I know is more important that everything I do know. What I haven’t learned is more important than what I have learned. All my past experience has only given me a false confidence to serve in this role. In every way, I must approach this position with genuine humility and openness to grow into the job, and pray that I don’t sacrifice the company on the altar of my own ignorance. 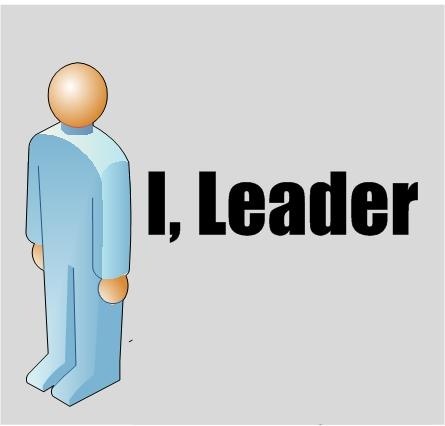 A person who ascends to the top leadership role in a company is on more secure ground with this attitude than with the hubris that they are the best person for the job. 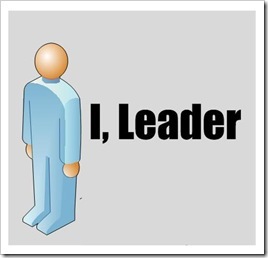 It is one thing to think we have this attitude of humility toward our leadership role. It another to establish the personal behaviors and create the organizational structures that support the practice of this attitude. The key to remaining a whole functioning human being in the function of executive leadership is to practice openness. A closed mindset narrows and reduces the options open to us. 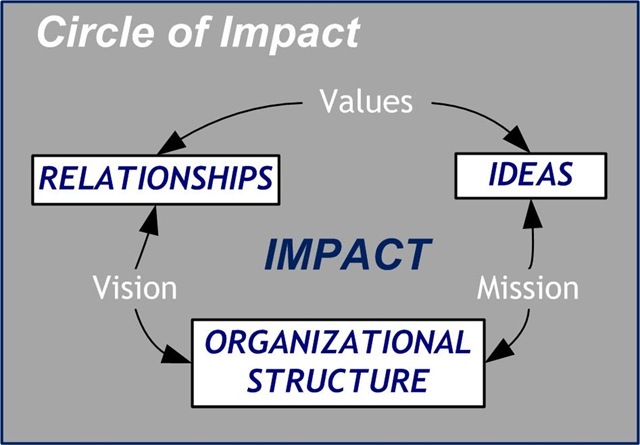 When this happens the connecting ideas of our Mission, Values and Vision lose their vitality, and we become robot-like in our activities of rational decision-making. When we lose the heart of leadership in this way, we lose our intuitive connection to our surroundings. We cease to see that which we can only see when our emotions are engaged. Seeing the big picture is not simply analytical process, but rather a holistic one where both our left and right brains work in coordination to help us to see beyond the facts to the story behind the facts. We do this by intentionally working to remain open to possibilities that exist on the periphery. 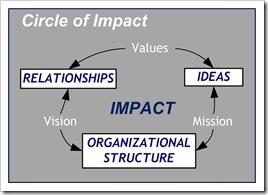 The Circle of Impact provides us a framework for guiding us towards a more open approach to the practice of leadership. 1. Openness toward Ideas. New ideas or new approaches to old ideas are a great resource for leaders. Where do we find these new ideas? We listen to people. Listen, not to respond, but to learn. If we approach every encounter, not as a management one, but as a learning one, we begin to develop a larger, more comprehensive picture of the situations we are in. We approach being open to ideas from the attitude that we don’t know everything we need to know. We assume that other people have knowledge and information that we don’t have and that we need to know. The way we learn to practice this openness is to ask questions. We don’t ask question to test their validity, but rather to discover their value. This is not an attitude of constant openness where no issues are ever resolved. Instead, we make decisions and act based on the information that we have at the time. And we learn to adapt to changes in circumstances and the acquisition of new information so that we are constantly learning, deciding, and acting in a constant dynamic. 2. Open to People. Let’s make the assumption that everyone in your organization is functioning at less than 50% of their potential. What would be the impact upon your business if you raised that percentage by 10%? To be open to people is to believe that they have resources of insight, information and inspiration that have not been tapped. Our relationship to them is the key to releasing that hidden potential. How do we do this? 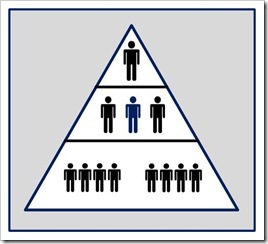 The hierarchy of organizations forces us into relationships of authority and subservience. 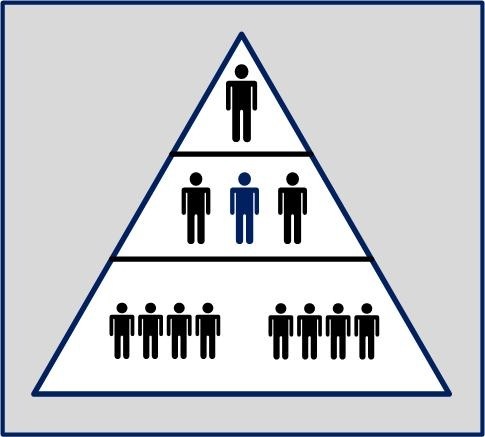 We allow the structure of hierarchy to dictate how we related to one another. The structure dictates that the “top tells down; the bottom reports up.” In a more open structure, the “top asks down, and the bottom tells up.” Openness is exhibited in the recognition that those are are the farthest reach from the top have perspective and insight that is valuable for leading the company. How do we as leaders in positions of authority create this sort of relationship in our organization? First, we express gratitude to others by saying thanks. We do this by associating with them in ways that are meaningful and inclusive. We respect their contributions to the company and say thanks in simple ways that matter. For a team that has done something exceptional, we can surprise them with breakfast to say thanks. In the expression of gratitude we honor people for their service, we establish a relationship of trust by recognizing what others may not see. Second, we listen to them, and validate their best ideas with action and recognition. The executive who listens to the maintenance staff to line workers to the receptionist opens up the whole company to his or her awareness. The people who are hidden in place sight know things that no one else knows. Their perspective of time and values are often keen and simple, and for that reason true. To listen in a genuine and open manner is to serve as a leader. Listening in this manner creates a more collaborative atmosphere where people are more free to share their ideas. When there is more conversation, there is greater openness to discovery the best path to take in resolving issues and fulfilling opportunities. 3. Open up organizational structures. To create more open structures is to elevate the place of interpersonal interaction. It shifts the structure from the dictator of relationships to the facilitator of them. In this way, collaboration and coordination become the norm. As more people find their ideas heard, not only does confidence grow, but trust in the leadership of the organization grows. 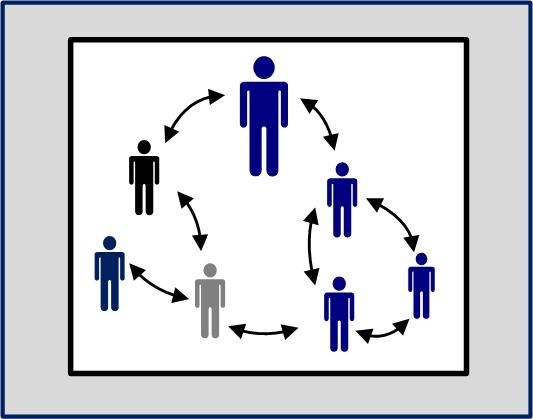 And communication flows up and down the hierarchy to facilitate even greater openness. If a leader wants to create a more open leadership environment, it has to be more than just a better attitude. Openness to new ideas and people lasts only as long as it works. In most organizational structures, the dye is cast against openness toward a closed regularity that predicts the future. This is a program for failure as the future is not predictable. Creating an open environment awakens both the mind and heart of leaders to see a larger, fully picture of their organization in the context of the moment. This openness provides the ground for the kind of adaptability that is necessary to taken advantage of the opportunities that are presented to us each day. The future may be as science-fiction writers tell us of robots gaining a heart and feeling as we do. Maybe we are the robots of today needed to seek a greater openness in our organizations so that we too may fully realize the potential that resides in each person and each opportunity that we have at hand. Tagged with analytical, closed, emotions, heart, ideas, intuition, leadership, open, people, relationships, robots, science-fiction, structure.